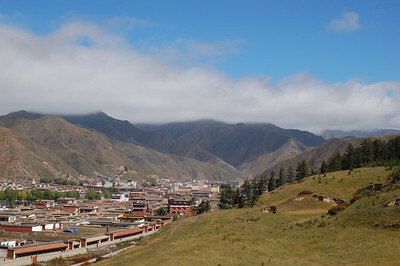 We got off the Dunhuang-Langzhou night train and got on a bus to the town of Xiahe to visit the Labrang Monastery. The monastery is home to almost 1200 monks (the most of any monastery outside Tibet Autonomous Region, but far less than pre-1959). 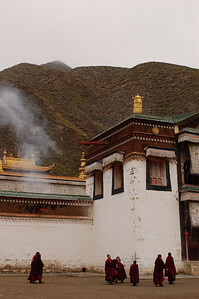 It is a Geluk School (Yellow Hat), Tibetan Buddhist monastery and is the seat of an important line of reincarnated lamas, the Jamyang-zhaypa Rinpoches. 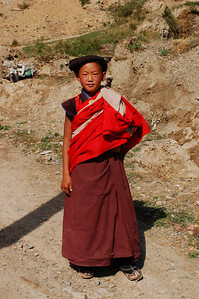 According to the resident monk/tourguide he is the third most powerful Geluk lama after the Dalai Lama and the Panchen Lama and is currently a six year old boy. From the bus station in Xiahe, we first walked past the white bathroom-tiled buildings, neon signs, Chinese-owned Tibet souvenir shops, and other Chinese trademarks before meeting the clear demarcation between China and Tibet. Arriving late in the afternoon, we met the crowds of Tibetan pilgrims, nomads and locals doing their evening circuit around the monastery, shuffling clockwise around the stupas, spinning their prayer wheels while arranging their ornate jewelry and extra-long sleeved jackets. For pilgrims, this is the time to bring out their most colourful and precious clothing. The women in particular are covered in heavy-looking turquoise and coral jewelry including huge headpieces. Men are wilder looking, with long scraggily hair, cowboy hats and huge overcoats with sleeves close to dragging on the ground. We haven't figured out exactly why the sleeves are so long, but they are definitely incorporated in Tibetan dance. There are two main styles: one is to tie both sleeves around the waist forming a giant bunch, the other is to keep one arm in a sleeve and one arm out with the empty sleeve hanging loosely at the side. We ended up sleeping in a wing of the newly opened Thangka Painting Training and Cultural Centre. A well-known painting master (and local monk) raised money and opened the beautiful Tibetan style centre to train young aspiring Thangka painters. One wing of the centre has been converted into a youth hostel, with monks coming in and out, surfing the internet, watching prayer DVDs and snacking on butter tea and various yak-derived food items. We were the only non-Chinese speaking residents and we quickly made friends with an older monk, trying to perfect his self-taught English. He gave us a tour of the impressive centre (still in construction) and accompanied us into town a few times. Even though the town is crawling with tourists, it doesn't alter the atmosphere too much because there are so greatly outnumbered by monks and pilgrims. The only time we felt a little overwhelmed was when we took the guided tour of the monastery along with about 100 other tourists. We didn't quite manage to all fit into the temples, our guide was utterly exasperated as he tried to keep us all together. The Labrang monks can't exactly be qualified as friendly, they can't really be blamed for being tired of tourists shuffling through their prayer sessions and taking excessive amounts of photos (guilty). We were mainly ignored, but were sometimes greeted by eager English speaking monks, one even pointed out his supposed scars at the hands of the local police and mentioned Canada and Germany's meetings with the Dalai Lama. You couldn't look down an alley of the monastic city without spotting the crimson robes of a Labrang monk. 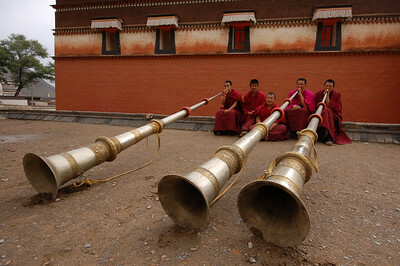 Various daily monk-activities include praying (or course), in two two-hour sessions, Tibetan longhorn practice, cymbal practice, debating circles and Cham dance practice. We witnessed most of the activities at some point during our visit. 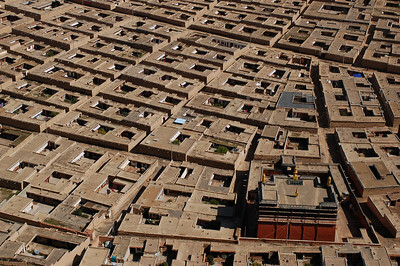 Past the monastery is a Tibetan village which houses a nunnery and a smaller monastery. We visited the nunnery, whose resident nuns, in great contrast to the Labrang monks, were friendly and energetic, laughing and requesting photos (we concluded that they don't get too many visitors). Leaving the nunnery we passed the mysterious Tibetan Red Sect Monastery, which we couldn't figure out how to enter. We did however spot a few of the monks, who, in contrast to the Yellow Sect monks, wear their hair in a long braid wrapped around their head and drape themselves in a red and white flag-like robe. Through the hills surrounding the monastery we followed the kora (prayer circuit) and got get great views of the monastery streets and temples. Spiritual beings that we are, we walked the kora two afternoons in a row. 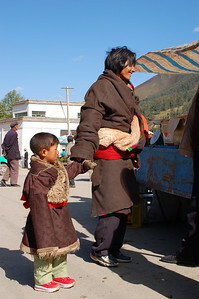 Despite a tight schedule, we dragged out our time in Labrang by an extra day. For the first time in a while we weren't eager to get going; great accommodation, a colourful atmosphere and beautiful surrounding scenery kept us from moving on. Even though this is from some time ago, it was very interesting to find out how things have changed since I lived in Labrang in 1997 - and the photos are fabulous! My name is James Robert Tongren (jrtongren@liberty.edu). I am very curious about the history of TongrenTown. I had two great aunts who were nurses there. This was around the time of the Boxer Rebellion. All Tongrens are related, it is not a common name . Please help me discover my ancestry! Thanks. Let Us Out of Tajikistan!